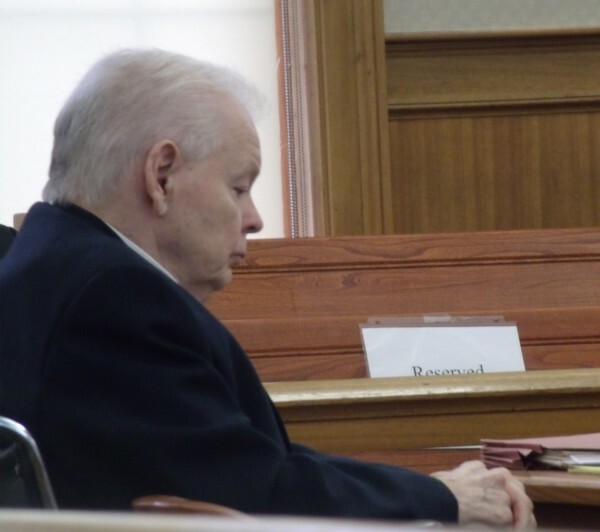 George Jaime attends the first day of his trial in Aroostook County Superior County in Houlton on Tuesday. HOULTON, Maine — An Easton man testified Wednesday that a man on trial for murder told him he dismembered the victim’s body and then burned it in a commercial boiler. James Campbell, 48, who formerly lived in Presque Isle, also told jurors that he helped the murder suspect’s son clean up blood from the crime scene after the victim was killed in the fall of 1998. Later on Wednesday, the murder victim’s 32-year-old daughter collapsed into tears on the witness stand when asked by Assistant Attorney Andrew Benson if she had seen her mother in the last 15 years. George Jaime Sr., 76, of Presque Isle is charged with intentional or knowing murder in the death of Starlette Vining, also of Presque Isle, who was 38 when she was last seen alive in October 1998. Though Vining’s body has not been found, Jaime was arrested and charged on July 12, 2012, at the pawn shop he operated on Main Street in Presque Isle. Benson said in his opening statements on Tuesday in Aroostook County Superior Court that Jaime and Vining had a turbulent relationship and that Jaime murdered Vining in the fall of 1998 in a rage. That same day on the witness stand, one of Jaime’s sons, Ted Jaime, 44, testified that he saw Vining’s stabbed and bloodied body in his father’s apartment and that his father later told him he had murdered Vining with a Marine style KA-BAR knife that he later pawned at his shop. Ted Jaime also said that his father put the body in the basement of his pawn shop wrapped in a blanket and tarp while the younger Jaime was off trying to find his friend Campbell to help him clean up the murder scene. Campbell corroborated that story on Wednesday, telling jurors that Ted Jaime had told him that “his father killed Star.” He told the prosecutor that he agreed to go to George Jaime’s apartment the next day to clean up the crime scene, and arrived there to find a “big bloodstain” on the rug. Campbell testified Wednesday that he never saw Vining’s body, but that Ted Jaime told him that his father had dismembered and burned Vining’s body, and that George Jaime told him that as well. “He [George Jaime] seemed kind of proud of it,” Campbell said. Defense Attorney Jeffrey Silverstein of Bangor challenged Campbell on several points that Campbell admitted he could not remember, and Campbell confessed to using cocaine and marijuana in the past. When questioned by Silverstein, Voisine said that Jaime used drugs, lied and physically and verbally abused her at times. Several Maine State Police detectives and technicians also testified Wednesday. When detectives first spoke to George Jaime, they say he claimed that he had lived in the same apartment in his building for 31 years, so they secured a search warrant for that apartment. It was only when Ted Jaime told them in July last year that his father was lying, that he had moved from one apartment to another in the building about 12 years ago, that they secured a second warrant. Evidence response lab technicians, a forensic DNA analyst and a senior lab scientist from the Maine State Police Crime Lab testified about “red-brown” stains taken from the basement of the building and from places in his 1998 apartment. The lab was unsuccessful in getting human blood or DNA from any of the collected samples. But the state police analyst and scientist both said that the samples were small in size and could have been affected by time and cleaning products. Campbell and Ted Jaime testified that bleach and other cleaning products were used to clean the bloody walls and floors, and 15 years have passed since the alleged murder. The most emotional testimony on Wednesday came from Vining’s daughter Sarah Redmond of Hancock. She grew up in Litchfield with her siblings and testified Wednesday that although her mother traveled to different states to work various jobs, Vining always wrote letters and sent cards and gifts at Christmas. Since his arrest last year, Jaime has been held without bail at the Aroostook County Jail in Houlton. No one else has been charged with a crime in connection with the Vining case. “And he just smirked and looked at me and said, ‘And nobody knows it but me,’” Voisine said. Justice Robert Murray is presiding over the trial which continues Thursday.